Kaspar Stanggassinger entered the Congregation with the intention of preaching the Gospel to the most abandoned. Instead, his superiors appointed him to form future missionaries. In addition to teaching, he gave pastoral assistance at churches in neighboring villages, especially by preaching. He was deeply devoted to the Eucharist, and in his preaching he invited all to have recourse to the Blessed Sacrament in times of need and anxiety. 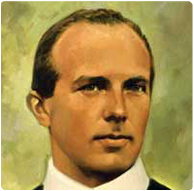 He was 28 when he arrived at the seminary in Gars, Bavaria, in 1899. He preached the opening retreat of the year to the students, but he soon fell victim to a fatal case of peritonitis. Kaspar used to say, “The saints have a special intuition. For me, who am not a saint, what is important are the simple eternal truths: the Incarnation, the Redemption and the Holy Eucharist.” He was declared blessed by John Paul II on April 24, 1988.